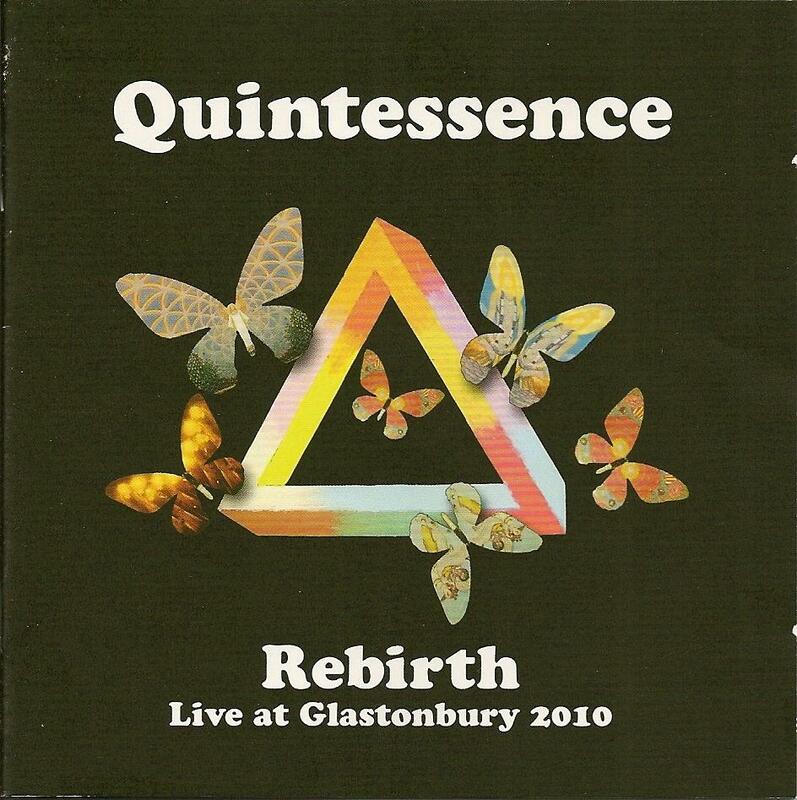 Quintessence - "Rebirth: Live at Glastonbury 2010"
In 2009 Hux Records released two sets of rare Quintessence performances from 1970 and 1971, providing unique insight into the Quintessence live experience, which could be quite different from that heard on the studio albums. In recent years, original guitarist Dave 'Maha Dev' Coddling has been performing in the UK with Maha Dev's Quintessence, a band he assembled to play faithful renditions of the band's songs. Vocalist Phil 'Shiva' Jones has lived for many years in the US and has released albums as Shiva's Quintessence with Swiss musician Ralph 'Rudra' Beauvert, in their case reinterpreting Quintessence classics along with original material. 2010 marked the 40th anniversary of the Glastonbury festival, which the original Quintessence had performed at in 1970. When the idea of a Quintessence reunion was proposed to the festival organizers they eagerly accepted, and Phil flew to the UK for rehearsals with Dave's band, leading up to two sets at the festival - the Rabbit Hole Stage on Saturday and the Glade Stage on Sunday. Hopes were high for a performance that would be worthy of release and the result is the gem of a CD that Hux has issued - Rebirth: Live at Glastonbury 2010. Due to technical difficulties the Saturday performance and first 20 minutes of the Sunday performance were unusable. But the 8 songs on the CD stand as a thrilling document of the performance, all the more impressive given that this was the first face to face meeting between Phil and Dave in 35 years. What is immediately apparent is that Dave has a crack lineup of musicians in the band, and regular Maha Dev's Quintessence singer Chas Roughley provided Phil with supporting vocals. Those of us who have followed Phil's work in recent years know that his voice is still in full form, powerful and passionate, and is well augmented by Chas Roughley. Only Love is an excellent opening track with a killer jazz-rock jam in the last minute of the song, guitar and flute dueling wildly. Phil's improvisational vocals jam out nicely with the band on Ganga Mai. Cosmic Surfer is an inspiring rocker. The Quintessence classic Mount Kailash opens with hypnotic didgeridoo drones and Phil's spiritual vocals which conjure up images of the Taj Mahal against a bright sunset. Intangible is equally mesmerizing, an instrumental that features flute, acoustic guitar and grooving ethnic percussion. Dance For The One is a standout, opening with a jazz-rock jam before launching into the song, with powerful supporting vocals from Chas. At over 8 minutes this is the stretch out track of the set. We're treated to trademark Quintessence Indian themes on Shiva's Chant. And the live set wraps up with the infectious rocking Notting Hill Gate, which includes the single most blistering jam of the set by both musicians and vocalists. A fantastic performance and Phil has said that if this ends up being the band's swansong he couldn't have been more satisfied. But wait… there's MORE. Rounding out the CD are four studio tracks. When Thy Song Flows Through Me is a beautiful song. Phil is at his most spiritually serene, backed only by an underlying meditative synth wave. Glastonbury Dawn is a brief piece with chirping birds that leads into Sunrise, which picks up where When Thy Song Flows Through Me left off. Phil is a powerful vocalist, but he is also a spiritually uplifting singer, and the combination of song, spoken word, light wandering drones, didgeridoo and sounds of nature washes over the listener like a warm summer day. Finally, Mendocino Bay consists of flute jamming against ocean waves crashing against the shore and Phil chanting 'Rebirth' at the end. It should be noted that the CD was produced by original Island Records era Quintessence producer John Barham. And like most Hux releases I've seen, the CD includes a massive booklet with detailed commentary by Colin Harper, Shiva Jones, Maha Dev, John Barham, and photos. Not to be missed!